From: A village between Leeds and Ilkley in Yorkshire. I used to make up a lot of stories when I was a child, and I’d tell them to my mother and her friends (getting into trouble once as I claimed in one story to have been attacked by a whale). I don’t remember writing anything down until I got to school – but once there, with a supply of paper and pencils, I was off. I think my first ever written-down story was about an otter, because I’d seen a picture of one in a nature book. From about the age of five. I remember telling my primary school teacher that I wanted to work for a newspaper. She didn’t think journalism was a ‘nice’ profession for a ‘nice’ girl (this was the 1950s) and didn’t offer any encouragement. She did, however, occasionally read out my stories in front of the class. Do you exclusively write contemporary women’s fiction or have you written in other genres? The first two books written with Sue (my co-author) were academic journalism text books. 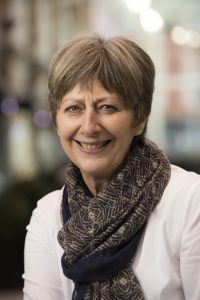 We had both completed degrees as mature students – and were both teaching journalism at different universities – when we saw the lack of good, practical books on journalism. The resulting books, Newspaper Journalism: A Practical Introduction, and Feature Writing: A Practical Introduction were both published by Sage of London and are still listed on university reading lists. I also ghost wrote two cookery books which, if you knew me and my cooking skills, would make you laugh. But a publishing company approached me and asked me to do it – and I thoroughly enjoyed the experience (especially the lunches the chefs cooked for me). When I’m not sitting at my desk writing, I’m generally thinking about what I need to write next. I make little notes when I’m away from the office, and have plot ideas when I’m out walking or swimming. Churning up and down the pool is a great way of thinking about where your characters are going next. 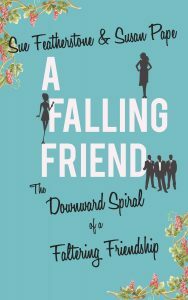 Our first novel, A Falling Friend, took eight years to write because Sue and I were working full time and had family commitments. The follow up, A Forsaken Friend took eight months because we’d both given up full time work, and family problems had eased a little. The final book in the Friends trilogy, A Forgiven Friend, should be finished by the summer because we both feel more confident about where it’s going, and what we’re doing. I have to admit, though, that the original first chapter of the third book took only a short while to write as I’d composed it in my head while out walking one day. Trouble is, I had deep reservations after I’d sent it to Sue for her approval. We both agreed it was not in the same style as the two earlier books – and would cause us problems further down the line. So I scrapped it. Preparation means coming up with ideas for characters and plots, which involves meeting with Sue (for coffee and/or lunch) to discuss our thoughts. We agree – or disagree – make copious notes, and go away to start writing. But you can bet that by the time we start sending each other our completed chapters, we’ve both gone off piste. It’s amazing how characters take over once you start writing, and how new plot lines develop as you go on. Research is vitally important – especially if you’re writing about something you know little about. We might be writing fiction, but we don’t like ‘making it up’ completely especially if there are factual points to be made. I would hate to write about somewhere in Yorkshire – my home county – and get it wrong as there would be many dozens of people wanting to correct me. 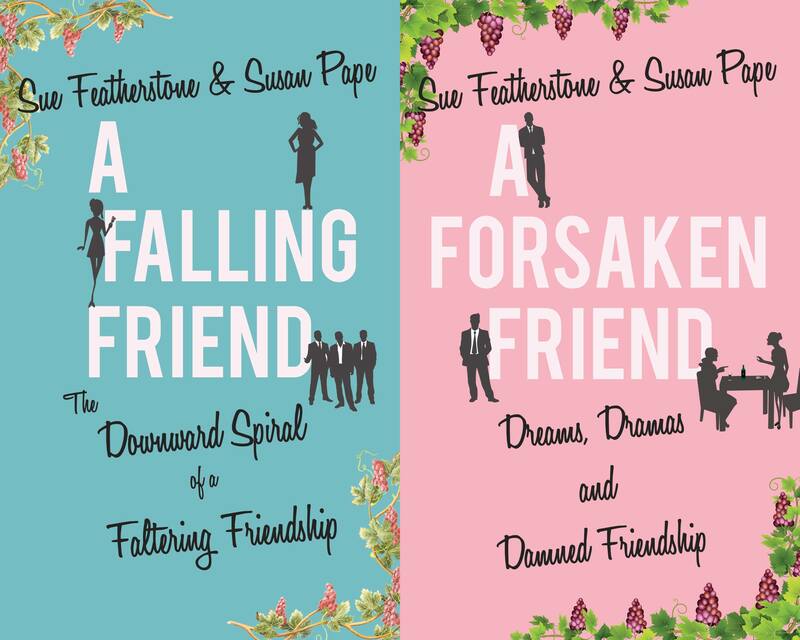 Both main characters in A Falling Friend and its follow-up, A Forsaken Friend, have travelled – but to places that both Sue and I have visited, so we know what we’re talking about. Otherwise, our two novels feature academia and the media quite strongly. But that’s fairly straightforward for Sue and I because we’ve both worked in those environments, we know what goes on – and we’re happy to spill the beans! One of my plans is to visit Spelsbury Church in Oxfordshire. It’s where John Wilmot, the 2nd Earl of Rochester is buried. He’s probably the most controversial poet within the restored court of Charles II, and a total libertine. 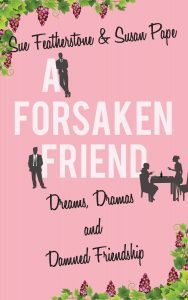 He features in both A Falling Friend and A Forsaken Friend, because he reminds one of the main characters, Teri Meyer, of her one-time lover, Declan – a philandering rake. He will be making another appearance in the final book in the Friends trilogy, which Sue and I are currently working on. The inspiration for my part in A Falling Friend was tripping over a ‘Cleaner at Work’ sign, conveniently positioned just inside the door of the Ladies’ loo at the university where I worked. I tripped and cursed, but there was something about that sign, put in a position where it would cause maximum inconvenience, that summed up my life at the time: ridiculous things were trying to trip me up. I couldn’t get the phrase ‘conveniently positioned’ out of my head and wrote it down… and suddenly there was Teri Meyer rushing into the Ladies’ loo, tripping and cursing as life conspired against her. It’s difficult to pinpoint a specific genre as I have quite an eclectic taste in books. Of course, I enjoy intelligent women’s fiction but I also love well written novels – from the historic (Philippa Gregory and Hilary Mantel) to the contemporary (Joanna Cannon and Marina Lewycka); but I also enjoy books by Sebastian Faulks, Anthony Doerr and Fredrik Backman – to name but a few, as they say. Some of the situations in the books are exaggerated versions of real events. But I couldn’t possibly divulge further! Oh yes… but Sue says I mustn’t tell! However, I have a mental image of each of ‘my’ characters and they invariably start with someone I know, someone who caught my attention in the street, or an actor, for instance. One of our current characters, Duck’s Arse (or Richard Walker) is actually the actor, Greg McHugh. 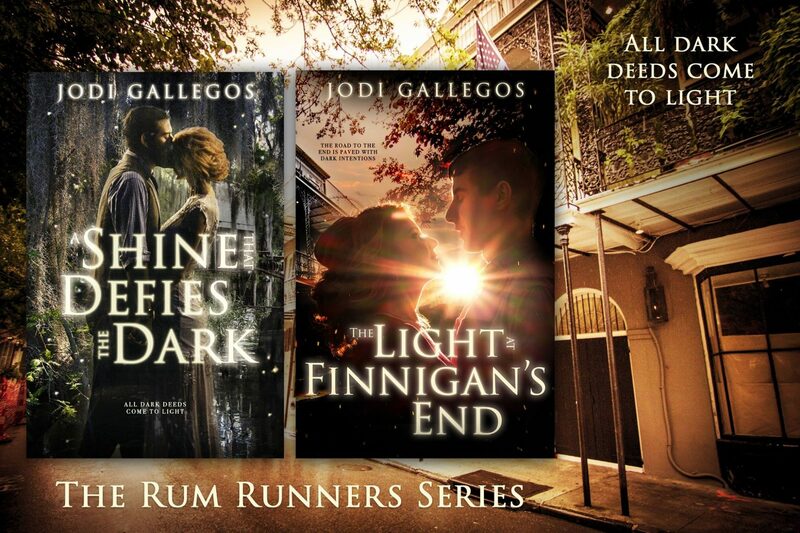 He doesn’t know it yet, but when the Friend trilogy is turned into a TV miniseries (I wish! ), lovely Mr McHugh will be asked to play D.A. The first time I Googled myself I found I was a prominent member of the Law Society! I am now a chief financial officer at the San Antonio Express-News, and also something of a whizz with dressage horses. Clearly, I’m none of these important people! A butterfly. I love their quiet gentleness. Marketing and promotion, which might sound strange coming from someone who has a background in journalism and public relations. But I find it difficult promoting myself, and thinking of good things to say about me and my writing. It’s not modesty – because I don’t think I’m particularly modest – it’s more a case of, will people believe what I’m telling them? Stop talking about it and do it. Any number of people tell me they’ve got a book ‘inside them’ or they’ve always wanted to write, but don’t have time. My advice: get some paper and a pen, or sit at a computer – and start writing. Congratulations! Getting published is a huge achievement. Once that’s done, keep going – promote and push your book so that as many people read it as possible. I ‘meet’ other aspiring and new authors mainly through Twitter and Facebook. I have also been mentoring a young writer who is writing an extraordinary memoir, and I encourage others by listening and making suggestions. But it’s only in exceptional circumstances that I’ll read someone’s manuscript. Let me see a chapter or two, by all means, but please don’t ask me to edit the whole thing.